Time is supposed to be a constant, but I’m not sure I believe it. Fall seems to have arrived faster than ever this year. Not only that, but Halloween is just around the corner, and the other holidays will follow shortly thereafter. One thing I used to struggle with during the holidays is how to address candy in our home. Because my son is a diabetic, and has been since the age of four, candy was mostly off limits for him. He’s grown up and moved out on his own now, though, so it’s not really an issue for us anymore. However, there are several reasons, other than diabetes, why candy is not the best thing to give all young children at holiday times. For instance, some children can’t have candy because of sensitivities to certain foods or dyes. Others may have allergies or become hyperactive if given too much sugar. But what can people give as a holiday candy alternative that won’t cost an arm and a leg? Here are some cheap holiday candy alternatives you could use instead. Young children really like stickers they can use on pictures or in coloring books. Pick up a few packs and hand out a sheet or two to young kids for the holidays without breaking the bank. Little bouncy balls keep some kids entertained for hours. Snag a few from a discount store or online party supply store for only a few bucks and give them out during the holidays. What child doesn’t love bubbles? They have been a hit with youngsters for years and they never seem to go out of style. Pick up a few inexpensive small bottles to hand out to trick-or-treaters or put in stockings. Tiny glow-in-the-dark creatures, balls, or other fun items always bring smiles to young faces. Give some of these to small party guests instead of candy and keep your costs low at the same time. Little pocket flashlights, glow necklaces, or glow bracelets are great fun for young kids when the lights go out. If you only have a few guests you could use these as a great holiday candy alternative. 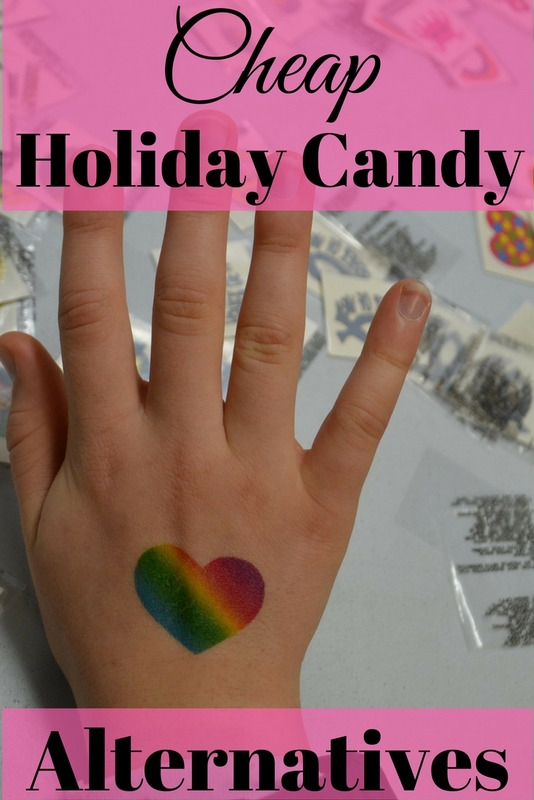 Temporary tattoos are another item you can use as a holiday candy alternative. They won’t rot teeth and they’re cheap too. Give these away at Halloween or Christmas and yours will be the most popular house to visit on the block. Children that are a bit older like pocket hand sanitizers. Pick up a few to give out as small gifts instead of candy and stay on budget. Another cheap holiday candy alternative is small travel size lotions. Grab a few when they are on sale and use as small gifts in place of sugary sweets. Small kids love little cars they can collect or take with them to pay with. Purchase a few at a local discount store you can give away and still keep your holiday finances on track. Buy some fake mustaches for just a few dollars and distribute them instead of candy. Take it a step further and have everyone post pictures on social media of themselves wearing them. Pocket sized puzzle games or miniature card packs are great party favors and holiday candy alternatives. They don’t cost a lot so you can pick up several for only a few dollars. If you are giving balloons as a holiday candy alternative make sure you are giving them to the right age kids. Packages of balloons are inexpensive and have lots of colors so each child can get their favorite. Even though it can be tricky trying to come up with cheap holiday candy alternatives that keep your budget on track it is possible to do. It also feels like a bonus when you see the smiles you’ve put on all those young faces. What cheap holiday candy alternatives have you used?